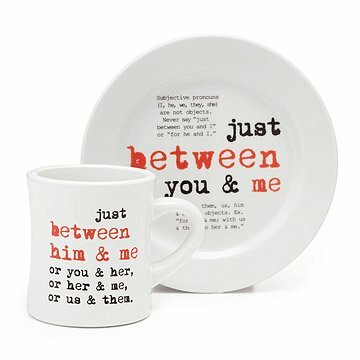 Drink to the delicious sight of grammar done right with these punchy plates. Get your caffeine fix as you wake up your appetite for adjectives, adverbs, and other delectable parts of speech. An A+ gift for English teachers, professors, and self-proclaimed agents of the Grammar Police. Made in China printed in the USA. Check out our coordinating Grammar Rules Plates! Please note, the Grammar Rules Mugs have been discontinued. When each style sells out, it will no longer be available and will be removed from the drop down. At this time, the Adverb is the only style still available. If you have a grammar nut in your home, this is the perfect gift! Given as an end of school year gift to my daughter's teachers, this gift rocks. Right up the educational alley and of practical use too. You cannot go wrong with this one. These 10 oz. mugs quench your thirst for knowledge.